Acting AG Matt Whitaker: Judges Should Be Christians - Joe.My.God. Donald Trump’s new attorney general once said that judges should be Christian and proposed blocking non-religious people from judicial appointments. Matthew Whitaker, who was made acting attorney general on Wednesday after Trump fired Jeff Sessions, said judges needed a “biblical view of justice” and questioned the judgment of secular lawyers. 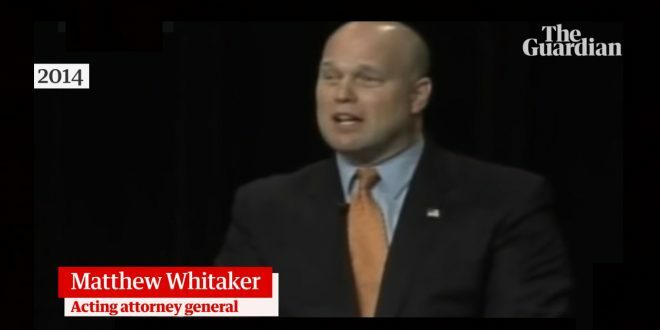 Whitaker made the remarks at a conservative forum in April 2014, where he appeared as a candidate for the Republican US Senate nomination in Iowa. Video clips of the event were saved by People For the American Way, a liberal campaign group. The event moderator, conservative blogger Erick Erickson, asked Whitaker whether he required a “Levitical or New Testament” view of justice. Whitaker opted for the New Testament.